MSI has unveiled laptops based on Intel's Calpella platform – with the C-series and G -series using the latest Core i5 processors. MSI believes that the new platform brings 'truly staggering' performance, with a 30 per cent outperformance of its predecessors claimed. "In the months leading up to CES we've seen huge advances in software and hardware, including Windows 7 and the new Intel Core i5 and i7 Arrandale processors and Calpella platform", explains MSI President Joseph Hsu. "We're extremely proud to announce notebooks that make full use of this technology to significantly outperform their predecessors." MSI's GX640 and GX740 Gaming Series notebooks are powered by Intel Core i5 Duo Core processors and use the newly announced ATI Mobility Radeon HD 3D discrete graphics cards, supporting DirectX 11. The CR420, CR620, and CR720 Classic Series notebooks feature 14" to 17.3" LED screens and are 'designed for users wanting an all-round notebook that doesn't compromise on power and quality'. 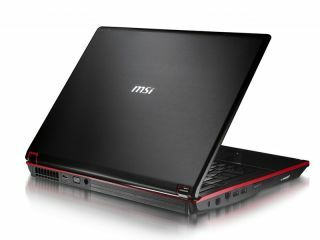 The MSI GX640 and GX740 notebooks have a UK release date of March 2010. Prices start from £999.